Whiterun Trooper is a common Strength creature card. It is part of the Core Set. "If I die, I'll take some with me!" 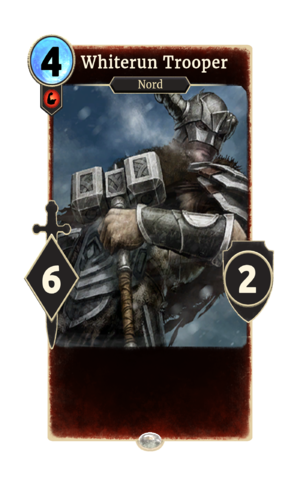 This card was previously part of the training mechanic where it could be upgraded from Whiterun Recruit at level 3. Despite nominally being part of the Core Set, the two copies part of the starter deck Band of Survivors you start with are the only copies you can obtain without Soul Summoning. The card is named for the Skyrim city of Whiterun. This page was last modified on 14 February 2019, at 00:36.